Revolution by Jennifer Donnelly. Grades 9-12. Delacorte Press, October 2010. Reviewed from ARC provided by publisher. 472 pages. Andi isn't just floundering, she's drowning. Two years ago, her 10-year-old brother was killed and Andi blames herself. She wasn't there to take care of him. And now he's gone. Her father's left and her mother's sinking deeper and deeper into her own madness. It's all Andi can do to make it through each day and the only thing that gives her any pleasure is her music. When her father finds out that she's failing her classes, he takes her with him to Paris so she can work on her senior thesis. 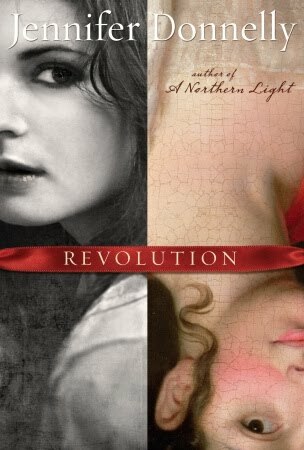 And when Andi discovers a hidden diary written by a girl during the French Revolution, her life will change forever. Jennifer Donnelly is a very talented writer. I connected with the character of Andi right away, even though she's not necessarily someone I would identify with. Her grief seeps off the page, but it's done in such a way that I immediately sympathized with her. Her pain hurt me, too. I was very intrigued by the beginning and I didn't want to put the book down. And then there was the whole diary thing. Andi finds a diary written by Alexandrine, a 17-year-old girl who was intimately involved with the royal family during the French Revolution. And because Alexandrine was a caretaker for the dauphin, the French prince who was the same age as Andi's brother when he died, Andi identifies with her and comes to care about her as she's reading the diary entries. The problem? I just never cared very much about Alex. I didn't care for how her story unfolded in the diary entries - I felt distanced from her and I would have preferred for the Alex parts to be told in straight first-person like the Andi parts. And then the last bit went to kind of a strange place and I wasn't really on board with it. I guess my problem is that it felt like three different books that were kind of mashed together. And it went on for so long (almost 500 pages), that I started to lose my patience with Andi. Now. All that said, I did love Andi. I cared about her. I loved her passion for music and I loved all the information about music that came through in the story. I was rooting for her as a romantic element was introduced. The novel's also fantastically researched and I can only imagine how much work that was. Ms. Donnelly includes an author's note as well as a comprehensive bibliography. And while it wasn't exactly my cup of tea, it's a very well-written and well-thought out book. It'll have fans. Many of 'em. Hey, Abby, you're doing great! How wonderful to have the 48HBC come right after you got a bunch of loot at BEA. I hope I see you at ALA this month? Kidlit Drink Night at least? I'm so jealous of some of the ARC's you picked up. But then I remember that I STILL haven't read all the ARCs I picked up at ALA when it was in DC three years ago! So many books, so little time... even 48 hours is never as long as you think it is! Sondy, ha! I still haven't read all the books I picked up at that ALA, either.